According to the architectural principles of vertical zoning, usual in 1976 at the inauguration of the Vandamme library, it was not surprising to see places below ground level. This was the choice of the eminent Pierre Dufau, the designer of the Vandamme island, that seems incongruous today. To get there, the viewer is invited to go down a few steps, to go to a square garden that can remind us of an interior patio. Apart from this feature, SatOne was struck by the brutalist aspects of the structure and a visual heaviness that can still be noticed on the upper floors of the building. Characterized by elements like concrete, aluminum and glass, the only element that breaks with the monotony and apparent coldness of the structure is the presence of vegetation in the patio. Based on his observation of the surrounding landscape, SatOne transcribes in his work the essence of the place understood as a soil stratum. He reinterprets here the cuts on the earth’s crust as displayed in books of geography. The scientific aesthetics of these patterns are redrawn by the artist who, following a certain (aesthetically) earthquake, breaks the scientific exactitude of these lines and releases the volume of his current rigor thanks to a profusion of forms. 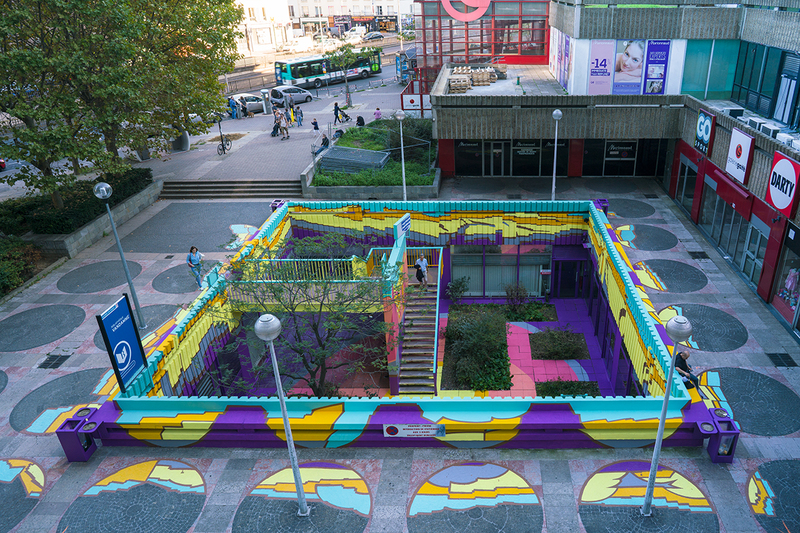 The viewer is intended to experiment the piece as a whole, a complex piece covering different types of surfaces like walls, floors and street furniture. Only the windows of the libraries remain blank although they become integrated into the composition thanks to the reflection they provide. In this way, the viewer is immersed in the work from infinite points of view. 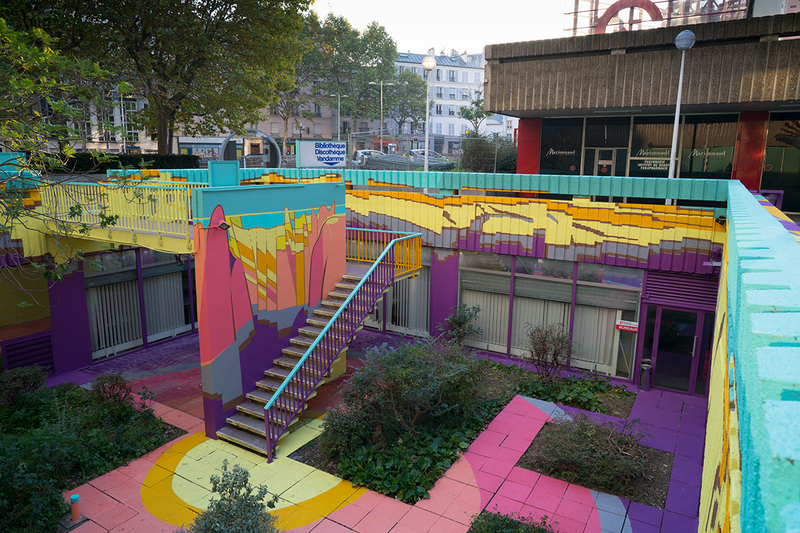 This intervention was supported by “The Art en Ville“ under the curation of Olivier Landes.